The trend of condominium development in Sri Lanka’s property market has been given a boost by Blue Ocean Group of Companies one of Sri Lanka’s largest and most respected conglomerates, headed by Chairman S. Thumilan, with some unique investment property, holiday home and luxury living concepts. 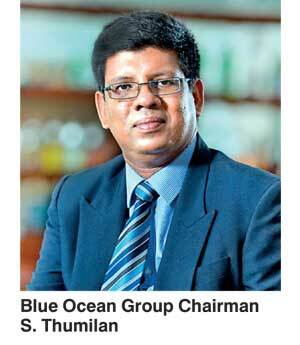 With economic activity improving and business confidence rising, year 2016 looks bright for investments into Sri Lanka’s booming apartment segment in particular and into the country in general, says leading property developer and visionary entrepreneur Thumilan, the dynamic Chairman of Blue Ocean Group of Companies. Blue Ocean Group is a dynamic and highly reputed international conglomerate involved in real estate and construction, education, corporate consultancy, trading, electrical and engineering consultancy and has its presence in the Middle East, United Kingdom and Australia. The Group’s Chairman, who owns an illustrious portfolio himself, is instrumental to the Group’s extensive diversification that include education, engineering and construction, real estate, corporate consultancy, trading, electrical and engineering consultancy. “To be the most respected, ethically sound and socially responsible company,” has been the base of conglomerate’s many endeavours, explains Thumilan. Embracing the ‘Blue Ocean Strategy’ that helped achieve generation of growth and profit through innovation, in a created and uncontested environment, the Group engages in its key markets in Asia Pacific, European, Middle East and East Asian regions. Covering all aspects of construction, its services encompass an umbrella solution to contractors and customers. The company offer both construction and consulting including for the construction of private houses. “The slow recovery in global markets in the light of improving investment climate in Sri Lanka has already made the India Ocean island nation an attractive destination for both investing and living. The decision by the government to introduce a new Investment Act that would grant tax concessions and tax holidays will ensure FDIs (Foreign Direct Investments) would come in leaps and bound into the country,” he added. “Wide-ranging reforms introduced by the National Government have introduced so many positive and encouraging changes that would undoubtedly boost the property, construction and infrastructure sectors of the country,” Thumilan opined. “Reducing both corporate for most industries and personal income tax to a highly attractive rate of 15% has made Sri Lanka an eye-catching economy for not only expatriates who desire to return but also for foreign investors to set up shop. We call upon both Sri Lankan and foreign investors avail themselves to the new opportunities the Government has opened up and consider Blue Ocean apartments as a highly desirable investment option,” he said. “It is a testing time for the construction industry in Sri Lanka since greater demand is being placed on the highest quality structures delivered within tighter deadlines. We at the Blue Ocean Group, are ready to face any challenge, since we have highly professional, experienced staff along with the latest equipment and machinery. The Group strives to deliver the highest quality, affordable products conforming to current architectural trends. We are proud to be one of the few top-notch construction companies that can undertake tasks of any size and complexity in the field,” said Thumilan. One of the greatest assets of Blue Ocean lies with its highly-talented and committed human resource pool including chartered architects, chartered engineers, chartered accountants, marketers, IT and other industry professionals. In comparison with market standards, each Blue Ocean professional’s contribution tends to add ‘real-value’ to the organisation, as they are highly-qualified, competent and well-experienced in their relevant industry fields. “The Group continues to perform well in line with our customers’ expectations despite the current challenging economic environment. We will continue to build and maintain our position as a strong international brand conducting our operations under sound corporate governance, carrying out all business dealings with the public ethically with optimum transparency. As a result, our customer base expands on a daily basis both locally and globally. “We at Blue Ocean Group have a strong vision to be the most-respected, ethically-sound and socially-responsible company wherever we operate. I trust this vision will prevail through all our achievements, whilst we will also continue to focus on acquisitions, mergers and strategic partnerships as a part of the overall direction the company is taking,” added Thumilan.